Available staff , really clean room and great location !! Excelleng stay. Close to a metro station and within walking distance from the St. Pauli district. Flawless wifi connection and delicious breakfast. Can't go wrong with Meininger. This hostel is not in the city center but very well connected by Altona station. The staff is friendly, the atmosphere good, the only thing is that the kitchen should be checked more frequently (soap, towels, ground) and more equipped with dishes, pots and stuff. The price is good and I would come back again. Ostello pulito. Posto simpatico. Zona relax alla reception. Possibilita di scendere in bar con l'ascensore dal piano senza passare per la reception. Posizione buona vicino alla stazione di Altona. Unico neo..dovrebbero abbassare la temperatura nelle camere. Wir waren sehr angenehm Überraschung. 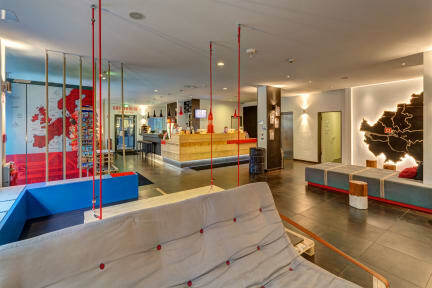 Für ein Hostel wirklich super. Das Zimmer war sehr geräumig und sauber.Das einzige was ich vermisst habe war ein Zimmersafe und es fehlte ein Papierkorb im Badezimmer. Ich komme gerne wieder.